How are you able to use every stage? Just by being open minded and realizing that just because a plant is maturing beyond the stage that most people use them at, it doesn’t mean that the edibility of that plant is over. An even better example is fennel. Most people know fennel as just the bulb and that’s what you use. You thin it out by selling it as baby fennel when its young. By thinning it out, you’re allowing your dominant roots and plants to expand, and get nice and big. Then you sell it as mature fennel. Then the next stage, it gets a solid stem in the center, and it sends a flower head out. You sell that as fennel pollen heads. Then the flower or pollen heads get pollinated and then it goes to seed. You sell the fresh seed. Fresh seed is the most intense fennel flavor you’ve ever had. You know what fennel seed is like when it’s dried? It’s in Montreal steak seasoning. In Indian cuisine, they give it a candy coating and serve them as a palate cleanser. The fresh seed is way more intense. You just need one little piece. Then the fresh seed dries on the plant and you sell the dry seed. So, five stages from one plant. That’s key for making a living from farming on a small scale. It’s not just selling it as one thing, being close-minded: okay, that’s what I have to sell, once it goes past that stage, rip it out or till it under. Not everyone thing is a good example. Because they don’t produce flowers? They do, but they’re not very useful in a culinary sense. There’s a use if you want to save seed from that carrot variety. If it’s a heirloom variety, you can save that seed. I’ve heard that the greens can be used for stock. Yeah. You’re gonna see it more in your smaller restaurants. There’s a lot of restaurants in Philly that don’t like to waste any part of anything that they get. Andrew Wood at Russet—he’s a perfect example. He does not waste anything. It’s smart. If you have something that’s useable, why not use it? That’s like with leeks—everyone thinks they’re just the whites. That that’s the only part you use. Well, no. Look at Asian cuisine. Look at Han Dynasty. You get the double cooked pork belly, the majority of what they’re looking for are the [green] tops. They want the tops more than they want the [white to light green] base for that particular dish. A lot of cuisines throughout the world use every part of every plant. If you’re willing to be a little creative, you’re able to find all manners of things in all the different stages of whatever it is you’re using. It’s waste not, want not. I know it’s clichéd but it’s really true. I know farmers who, once something bolts, they just till it under. Another good example is cabbage or anything in that family of plants known as brassicas. Cauliflowers are in that family, right ? I’ve seen them flowering in gardens. Yes. We started doing that 10, 12 years before a lot of these farms that are around now even existed. We just thought, we have one mild season….my dad knew that that’s something that could happen. We had a mild winter and we had all these slightly immature cabbage heads in amongst our cabbage patch that were left over and they survived the winter. As soon as it warmed up and the days got a little bit longer, the heads split open and the flower heads started coming out. You get this big central stalk that comes out of the middle and then all these little—they look like little broccoli rabe heads, and they taste way better than broccoli rabe. Out of cabbage. Red Russian kale will do this, as well as any kale variety. Brussels sprouts do this. What is this stage called? We call it a brassica rabe. Rabe is just a term for a fine head or a petite head. That’s pre-seed, pre-flowering. When it’s basically a floret that grows at each leaf juncture. It’s a 4-6 inch stalk that has a little broccoli looking head and the best part is, it’s sweet and nutty. There’s no bitterness at all. They’re tender. You can eat ‘em raw, you can eat ‘em cooked. I’ve eaten whole meals of them—they’re awesome. If they survive the winter and you don’t disc ‘em down immediately—a lot of farms never get to that stage because as soon as the ground is ready to be worked up, they just disc it down and that’s that. But if you’re lucky, some of them, say cabbages, survive, and you get rabe heads in the spring and they’re amazing. We actually did the numbers one year. We make more money off of the rabe than off of the cabbage itself. 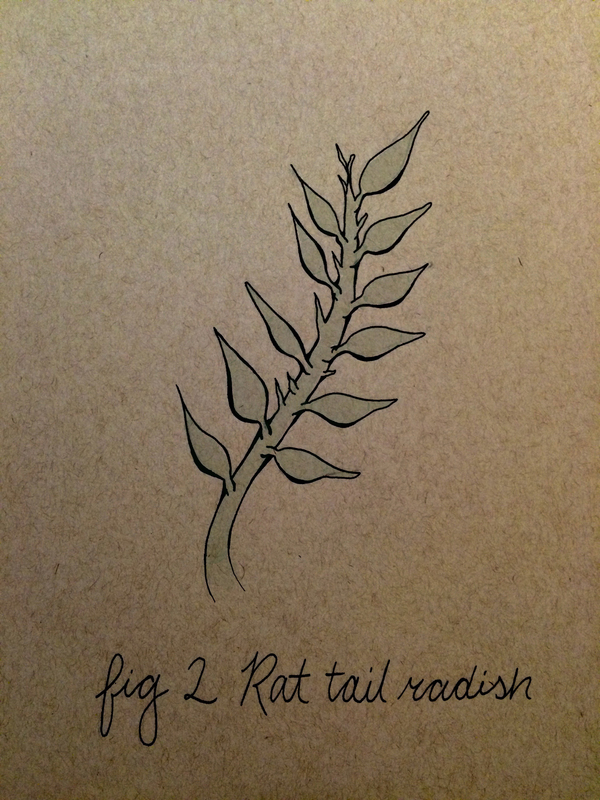 Budding rat tail radish. by Cailee Dennis. How common is this total approach? I think it’s becoming more and more common. I think more and more young farmers that are getting into the game are realizing that the only way they’re going to survive is utilizing every square inch of ground that they have and utilizing that ground to its fullest potential. I think it’s becoming more commonplace than ever before and that’s a great trend. It’s important to respect the land and treat it in that way. How does using every stage of the plant relate to that? It’s all intertwined. The reason for using every stage is not only for chefs. You’re trying to make as much as you can off of the limited acreage that you have. Utilizing every square inch in a more efficient way allows you to make more money off of the land. At the end of the day I can hold my head up high knowing that the farming practices that we do, we do it to not only provide a living for myself, my dad, my mom, but all the guys that work for us. We’re providing a live-able income for five single guys and two families. So, it’s beyond just ourselves. If I can make more money off my land, I’m gonna share that with my guys. That’s our incentive to crank out as much as we can on our property.